Like most things of beauty, there is more to the art than meets the eye. In the world of Suiseki, consider the scientific examples of The Golden Rectangle and Mangelbrot Sets. Euclid showed how to divide a line in mean and extreme ratio which we would call "finding the golden section G point on the line". Euclid used this phrase to mean the ratio of the smaller part of this line, GB to the larger part AG (ie the ratio GB/AG) is the SAME as the ratio of the larger part, AG, to the whole line AB (ie is the same as the ratio AG/AB). The Golden Rectangle can be seen in many suiseki stones, and is thought to be the most pleasing of all rectangles, not too thick, not too thin, but "just right." Widely used by the ancient Greeks in their architecture, the golden rectangle is represented in mathematics and useful in a wide variety of disciplines. The smaller rectangle is the same shape as the larger rectangle and their sides are proportional. For more information on suiseki and The Golden Rectangle, visit the National Bonsai Foundation website. The Mandelbrot set is the best known example of a fractal - it includes smaller versions of itself which can be explored to arbitrary levels of detail. 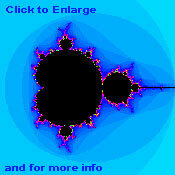 Mandelbrot sets frequently occur in nature and certainly in the world of suiseki. This is another way in which science has helped explain the mystery and beauty of suiseki, and our attratction to it. Just as the Mandelbrot Set repeats itself in nature, the mountain repeats itself in the suiseki "Yamagata-ishi" mountain stone, and the "Taki-ishi" waterfall stone - and all suiseki object stones. For more information click the window at left, or visit the Clark University website.